Closer to Indonesia than to any other Australian city, Darwin is the capital of the "Top End" - the remote, vast Northern Territory. Home to more than half of the territory's population, the city reflects the rugged endurance and individualism required to survive the Outback. Darwin also boasts a colorful history to add to that heritage. During World War II the Japanese bombed the city and threatened invasion. In 1974, Cyclone Tracy cut a destructive swath through the region. In addition, man-eating crocodiles, tropical monsoons, searing heat and bush fires that burn for weeks are all part of everyday life. Locals in the Top End consume over 60 gallons of beer a year. All those empties don't go to waste: Each year Darwin residents compete in the Beer Can Regatta, a race with boats, rafts and other vessels manufactured out of beer cans. Visit the Territory Wildlife Park, where the wildlife includes birds of prey, magnificent cranes, dingoes and crocodiles. Explore the Top End's famous Litchfield National Park. 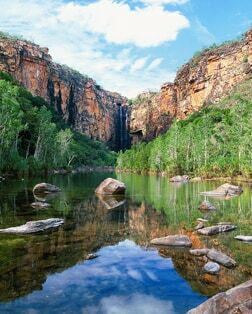 The park is home to giant, magnetic termite mounds, monsoonal rainforests and beautiful waterfalls cascading from a massive sandstone plateau. See the historic city sites from the water including the foreshore and city skyline while being regaled with entertaining tales from Darwin's past. The Darwin Botanic Gardens are a wonderful place to see mature, established landscaping and a wide variety of plants. This museum houses 1.2 million natural history specimens and over 30,000 items of art and material culture. Pause and take in the Northern Territory Parliament House. This fine Parliament Building occupies a major historical site and showcases the fine craftsmanship found in the territory. The Australian Aviation Heritage Center is one of the major aviation museums in Australia. The Center has an impressive presentation of aircraft and displays depicting the Territory's involvement in aviation. Built to house the staff of the British and American Telegraph Company, the cottage is a fine example of the colonial architecture common to India, Malaysia and Singapore.